Surya- the New Sun, an Indian Classical fusion band is conceived by the ace percussionist and acclaimed composer, Taufiq Qureshi. It beautifully amalgamates the flavours of ethnic and world music. 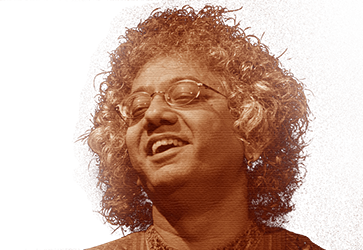 It is an explosive performance of Taufiq’s World Percussions fused with Indian rhythms on the Djembe and Hindustani melodies on either the Sitar or the Sarod; supported by the keyboard. Taufiq’s path breaking performances showcase the traditional flavour and intricacies of Indian rhythm, interwoven with his phenomenal command and sparkle of contemporary world percussions. Taufiq’s trademark style incorporates body and vocal percussions to create unique rhythmic motifs spanning across cultures. The mellifluous sound of the strings create melodies steeped in Indian Classical Music, which also are reflected through the electronic mode of the strings; (the electronic Sitar or the electronic Sarod) and fly beyond boundaries of Ethnic Music. Though the maestros have classicism in thought, they relate to the ideas and influences of present-day music. The wavelength of these accomplished musicians reaches a fantastic high when they perform together. Taufiq can grapple the pulse of the audience and communicate musically to varied audiences. Some concerts of Surya-the new Sun, also feature the versatile Indian drum, Tabla and additional percussionists to add an energetic zing. ‘Mumbai Stamp’ is an innovative band conceived and formed by TAUFIQ QURESHI, where trash material is put to use creatively to explore new rhythmic horizons. ‘Mumbai Stamp’, led by Taufiq; consists of 5 to 6 young drummers who play on all sorts of waste materials like bins, cans, tin boxes, buckets etc. Vibrant patterns of rhythm originating from these non conventional instruments take the audience to another level of energy. The power emanating from these spirited trash boxes, the superb co-ordination of the band and the phenomenal ability of Taufiq to stroke a rhythmic cadence out of any surface make MUMBAI STAMP a unique band. ‘Mumbai Stamp’ has entertained many an audiences, all over India. The amazing rhythmic motifs, Taufiq weaves along with his band members, leaves the listener wanting for more; the band enjoys the appreciation of all types of audience-be it music lovers, corporate world or the novice. ‘Mumbai Stamp’ has left its indelible “stamp” on many a hit Bollywood Blockbuster Songs and background scores, like Dhoom 2, Bhool Bhulaiya, ABCD 1 and 2 to name a few. This band catches the pulse of the audience and in fact is a spectacle to watch as well.